Fantasy comedy drama written and directed by Thomas McCarthy. 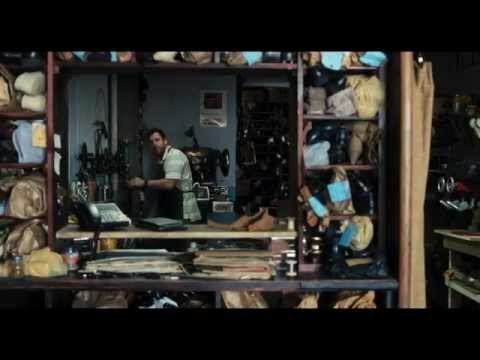 Lonely Max Simkin (Adam Sandler) repairs shoes for a living in the Lower East Side of Manhattan, a trade passed down through his family for generations. Max's ordinary life takes an unusual turn when he discovers he possesses a stitching machine that when used to repair a shoe, can transport him into the body of its owner. Freed from his existence in the shop, Max is let loose on the city under the guise of his various customers where he can cause mayhem without consequences. But it's not all fun for Max as he gets to truly experience what it's like to walk in another man's shoes. He even dons the shoes of his father (Dustin Hoffmann), who abandoned their family years before, to take his unfortunate mother (Ellen Barkin) out for the night. The film also stars Method Man and Steve Buscemi.